I don't know why Dead Gentlemen chose to interview him, but I'm contractually obligated to link to the video. Been a while since I posted, and not for any lack of interest. Sunday was my first day off pretty much all month. I had just finished a rather extensive rewrite on JourneyQuest and was about to switch gears into Grandmother Clock, but wound up unconscious instead. Apparently my body overruled my brain's mandate that there would be no nap time. Projects are coming along nicely. Momentum continues to surge on JourneyQuest -- we're in the process of juggling actor and location availability so we can lock down a shooting schedule. We're nearing the end of casting, and should have an announcement up early in the new year. Also may have a new office space next year -- Kat Ogden scouted out a startlingly lovely, surprisingly perfect potential workspace for Zombie Orpheus Entertainment. That's the new production company I'm founding with Kat and Ben Dobyns in January, the company releasing JourneyQuest and Strowlers (formerly called the Cascadia project). The office space is in one of the loveliest old buildings in downtown Tacoma. Right, forgot to mention -- we're moving to Tacoma, potentially as early as February, when our lease in Glendale is up. Camille and I are house scouting and will be taking a first-time homebuyers' course while we're up for the holidays. We've been approved for loans and have our realtor; we only have yet to choose a lender and find a house. And then spend months and months in closing. A necessary evil. Still worth it if it brings us home. Three days until Christmas. How does a holiday that starts marketing itself before Halloween sneak up on me? Our holiday letter will be late this year, as usual. Funny how time speeds up when you need it the most. 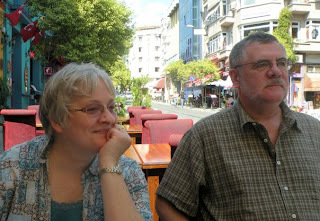 Follow the adventures of my parents -- the man who taught me my sense of humor, and the woman who taught me when it was appropriate to use my sense of humor -- as they start a new life teaching at an international school in Istanbul. The blog is Istanbullets. Enjoy the kebabs, you crazy kids. I'll have a writeup of the JourneyQuest location scout up by the end of the week. In the meantime, enjoy this pic of me losing a fight. Matt Vancil is this guy from Tacoma. The Adventures of Bug and Goober!